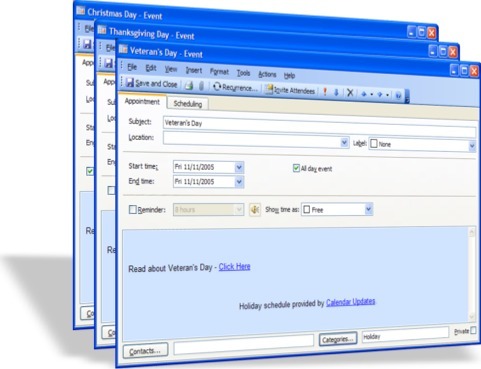 Our national holiday schedules include popular non-holiday events and other important dates not included with the original Microsoft Outlook holidays such as the first day of the seasons and Daylight Saving Time dates. See our holiday information page for a complete list of all events included in our holiday schedules. Select a holiday schedule below or click here to browse all holiday schedules. Choose this version if you plan to add the 2015 US Holidays to your calendar. This version does not contain holidays observed in both the United States and Canada. This will avoid duplicate holidays on your calendar.